RANSON, W. Va. — The juxtaposition is striking — in the spot where a former family-owned apple orchard once stood, a 24-hour-a-day factory is being built, where rocks will be melted into molten lava in the manufacturing of stone wool insulation. 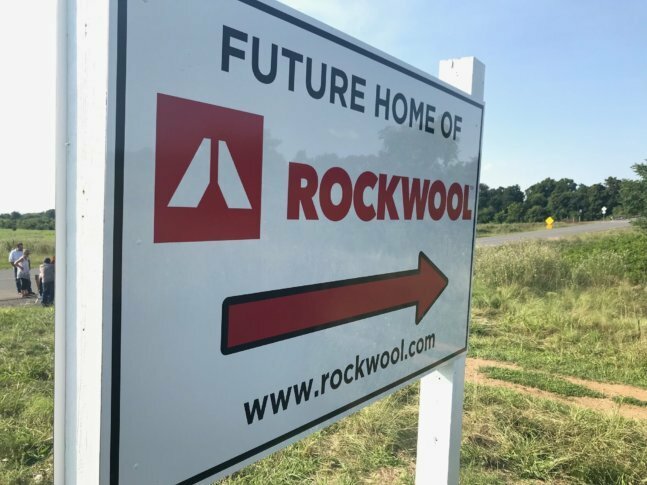 Just off Route 9, in what used to be considered Kearneysville, but is now part of Ranson, ground has been broken in the former Jefferson Orchards for the construction of a $150 million insulation plant, owned by Rockwool, a Denmark-based corporation. Neighbors in Jefferson County and the local Sierra Club say they were blindsided to hear the factory would include several smokestacks — with one being 21 stories high — and are expressing concerns about what will spew from them. “They heat up basalt rock, and it belches out all kinds of awful fine particulates and six different poisonous chemicals that I can hardly even pronounce,” said Regina Hendrix, with the Eastern Panhandle Sierra Club. According to Rockwool spokesperson Leslie McLaren, rocks are melted using coal and natural gas at temperatures over 2,700 degrees Fahrenheit. The future plant, which will employ approximately 150 people, will sit across Route 9 from North Jefferson Elementary School, and within a mile of three other schools. In the past week, more than 3,600 people have joined a Facebook Group: Citizens Concerned About Rockwool — Ranson, WV. Leigh Smith said she has two small children who will soon be attending school. McLaren told WTOP the company obtained its Clean Air Permit from the West Virginia Department of Environmental Protection in April, and has met all U.S. Environmental Protection Agency requirements. Another parent, Danny Chiotos is not satisfied. The Ranson facility will be the company’s second stone wool manufacturing plant in the U.S. Although there have been sporadic news articles in local publications about the plant, most residents say they weren’t aware of the scope of what would happen at the new plant — many thought it would be a warehouse and distribution plant, rather than a 24-hour-a-day plant, manufacturing products carried away by up to 100 tractor trailers per day, according to the company. Smith, Chiotos, and others in the Facebook group have said the company and local officials did little to explain to residents that a plant would release potentially dangerous chemicals into the environment. In a release, the city of Ranson said it is aware some members of the community are upset. Jefferson County Commission president Josh Compton, said the commission will hold a special hearing Thursday to hear from residents.